While flash floods are not unheard of in Malaysia, the flood situation plaguing West Malaysia is turning into a crisis with more than a hundred thousand Malaysian victims as a consequence. The Star reported Friday (December 26) that the number of flood victims has reached 119,087. The sudden influx of evacuees prompted the opening of new relief centers in all seven states. 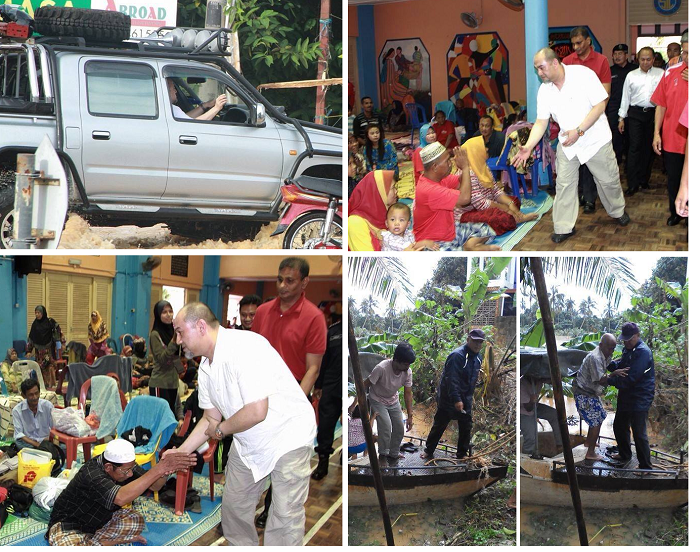 Kelantan bore the brunt of the flooding, having 45,467 flood victims while Terengganu had 34,884 evacuees. Pahang had 32,380 evacuees, Johor 537, Kedah 28, Perlis 209 and Perak 6,119 respectively, according to the report. This number has since increased to 200,000 flood victims according the Malaysiakini, from 160,000 victims on Sunday. 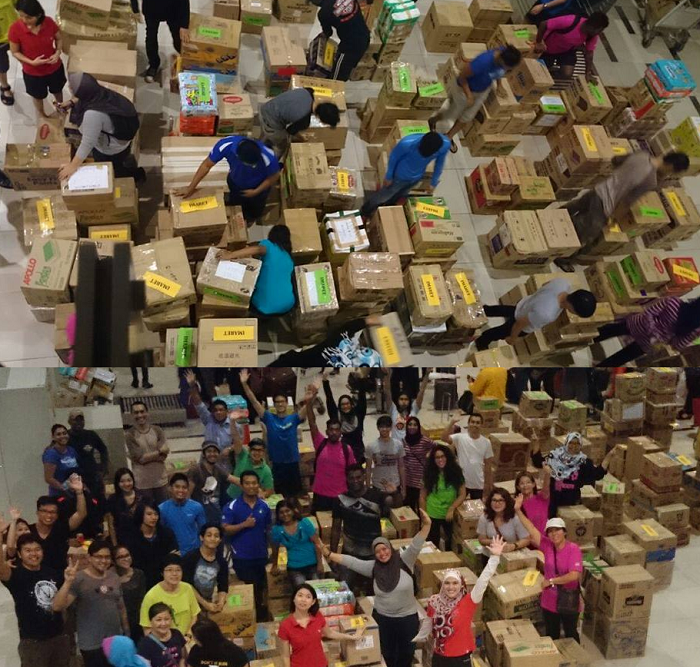 During this time of need, some Malaysians have stepped up to help each other out in every way they can. 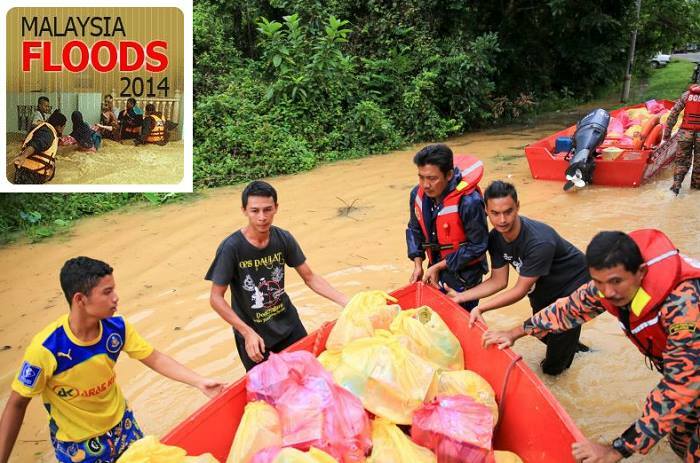 In this list, we share what a few of our fellow Malaysians have done to help. It is undeniable that without social media, most people who aren’t directly affect by the flood may not even know about it. Social media is a vital platform to both inform the public to what is happening, and share about the needs of victims. The latter is what prompted Abby Latif to post a plea on her Instagram account Friday morning. The post was preceded by the following alarming statement: “THIS IS A PLEA – PLEASE REPOST/SHARE”. 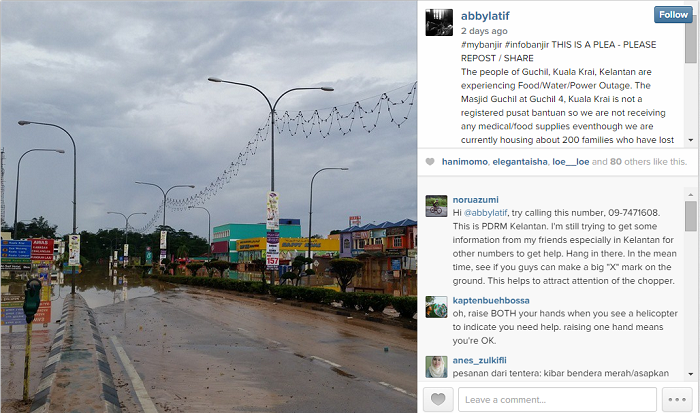 Abby Latif shared through her Instagram account that Masjid Guchil in Kuala Krai where she is currently located, has not gotten any medical and food supplies despite housing around 200 families. The plea asked for supplies such as candles, batteries for tochlights, gas to cook and food. Her plea did not fall on deaf ears, and was brought to the attention of relief groups and organizations to dispatch the necessary aid. She also posts Whatsapp conversations and pleas for help from other victims on her page. Netizens are responding to the pleas of flood victims online, sending assistance wherever necessary in response to pleas on social media. According the bbc.com, the word ‘banjir’, meaning ‘flood’ has been tweeted more than 750,000 times in the past week. Donations have been pouring in to the relief of the flood victims with netizens asking on social media where they can find nearby collection centers to assist in any way possible. 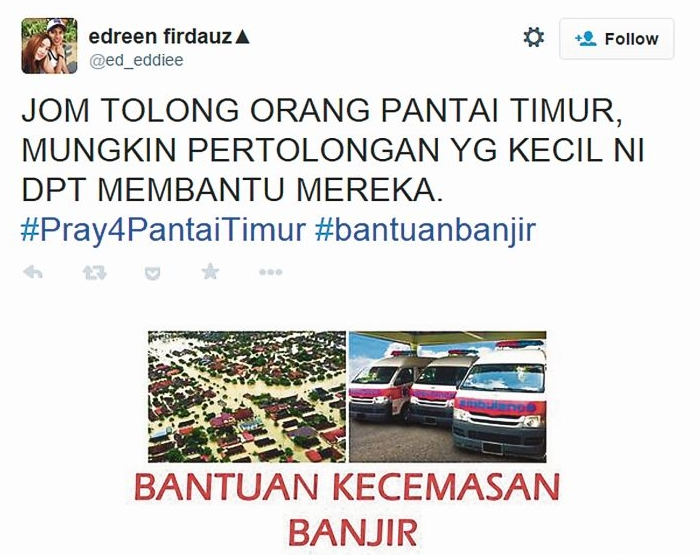 The hashtag #bantuanbanjir (literally help, flood) is used to express their will to help, as well as for victims to thank their helpers. It is also through social media that the need for helicopters is expressed, as victims are stranded in places unreachable through land vehicles and require aid using helicopters. Deputy Transport Minister Datuk Aziz Kaprawi told New Straits Times Online, “The country is in desperate need of more helicopters.” Up to 8,000 citizens are stranded in inaccessible areas without necessary aid and supplies. Malaysian Global Innovation and Creativity Centre (MaGIC) and local talent have come together to create a portal to provide netizens with the latest information regarding the floor on mybanjir.com, according to astroawani.com. 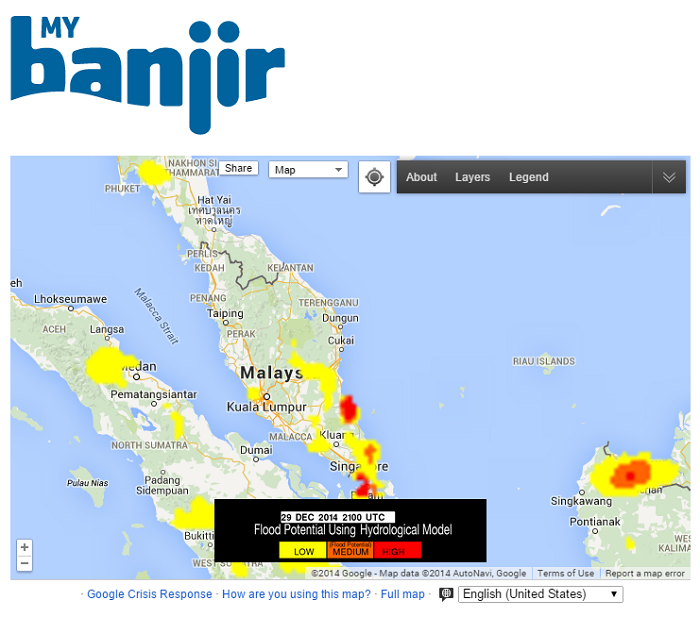 The hastag #mybanjir allows the website to compile the latest updates through this community initiative to their Twitter feed. The website also contains information of all the flood affected roads, weather forecast, river levels as well as an external link to a list of relief agencies and non-profit organisations. Mat Hassan, the program director at MaGIC, told Tech In Asia that they are doing as much as they can through their knowledge of social media and technical knowledge. “We hope that, through this, we are able to restore communications with loved ones and send much-needed supplies to the victims,” he told the online publication. Citizens are helping not just by donating supplies but volunteering together to help pack and load all the items into boxes and containers. One of the prominent philanthropists gathering volunteers and volunteering himself is Syed Azmi, whose Facebook page is full of information on where to volunteer, what to donate as well as where they can send their donations to. He is not alone in his cause, however, as thousands of citizens have stepped up in this time of need to help out in whichever way they can. The #FreeMarket team and other support organizations have been formed to collect essential items to be donated to the affected areas. 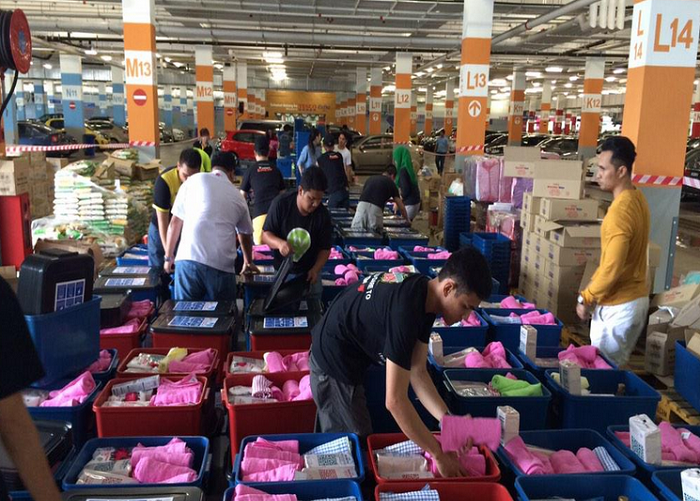 Malaysiakini has compiled a list containing information such as where and when you can make a cash/item donation as well as where you can provide logistical/medical support and help sort, pack, and/or deliver donations. According to the same online news portal, AirAsia Bhd is working together with Mercy Malaysia to help in post-flood clean-up work and repairs while Firefly Airlines is donating seats and cargo space on board its flights to aid the victims. Airbnb is also helping out the victims of the flood, mobilizing the host communities in Airbnb to offer their homes up for free to the flood victims. According to their site, all the service fees for those affected by the disaster and checking in between Dec 29, 2014 to Jan 12, 2015 are waived. 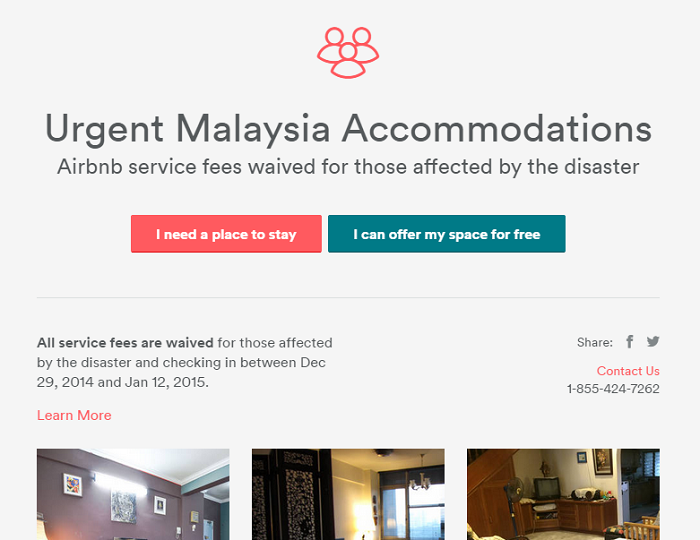 This is not the first time Airbnb is showing their support to those in need. During Hurricane Sandy, 1,400 Airbnb hosts in New York opened doors to those stranded by the disaster. “When disaster strikes, we can activate our response tool for a designated geographic area,” the site states. Airbnb emails hosts in the areas asking if they are willing to help and the existing hosts responds. If you need a place to stay or have an available space to host victims, do take a look at their site. “Turun padang” heroes refers to the people who go to the places in person in order to bring relief to the victims. In a Facebook post that has been shared more than 10,000 times, unassuming man is shown helping around in the flooded area in Kelantan. This would not be surprising if not for the context of the pictures. The post (translated) states, “He came without a fuss, neither reporters nor camera shadowing him as he drove himself to the flooded areas to help the citizens. When the flooding occurred, he can be seen helping around, drinking out of Styrofoam cups when he is tired and taking orders like the other volunteers.” It was only later when someone pointed out that he looked remarkably similar to Sultan Muhammad V (Sultan, or ‘King’ of Kelantan) that they realized that the man was indeed, their Sultan, who has taken upon himself to help his citizens in need. Our four-legged creatures oftentimes gets abandoned and forgotten during crises. 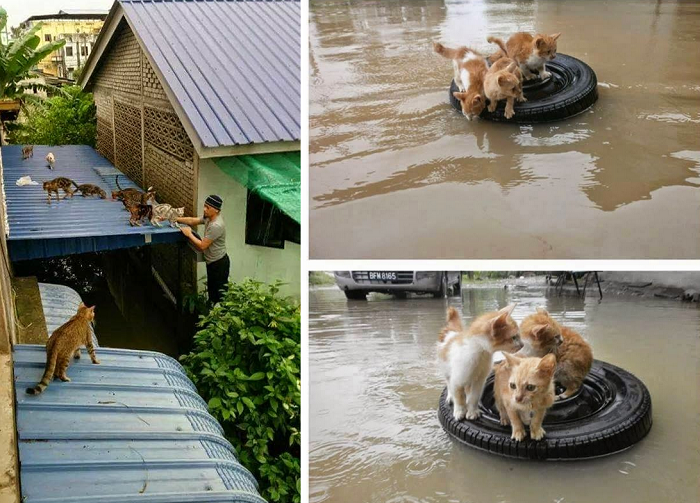 Thankfully, this is not the case during the flooding as animal-lovers have banded together to ensure that their furry little friends are not left behind. 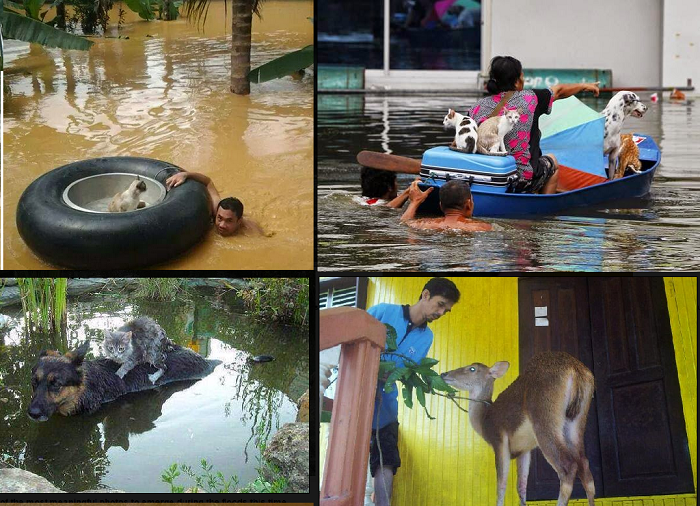 The Star reported such heroes who braved the flash flood to save the animals, during what was meant to be a merry Christmas celebration in Malaysia Independent Animal Rescue (MIAR). President of MIAR, Puspa Rani, along with several of her workers, risked their lives trying to save as many animals as they can. “Raj, one of my workers, had an electric shock when water flooded the power mains. He risked his life to rescue the animals and could have died. He is a hero,” Puspa told The Star. Non-human victims are not left behind, with volunteers helping to evacuate the furry little creatures from the areas, or at least move the animals to higher ground. Muhammad Razeef Che Samah, according to The Star, is working together with other volunteers to gather food donations for the rescue teams so that the animals will be fed. You can help out our fellow Malaysians too, if not in person, then through donations. Find out where you can send your donations to via MalaysiaKini’s list here or by responding to requests for help on social media sites.